I’ve been thinking about getting a Garmin for awhile now. It’s gotten to the point now that whenever I see a friend on Dailymile post their workouts using Garmin Connect, I get jealous. I’ve been running and tracking my stats with Runkeeper for over a year now. And for the most part I’ve been really happy with it. It does exactly what it needs to do for people that want to get ‘techie’ without getting too bogged down in the details. Their Live feature is great for tracking people during a race and I always liked being able to strap my phone into my armband and have one device for both my music and my GPS tracking. But I’ve learned I can’t depend on my phone for everything. Apparently these things aren’t meant to be put through torrential downpours and insane running sprees through ‘urban rivers’. After almost killing my phone just for the sake of making sure I ran the correct mileage in the rain one day, I decided I probably need to take the plunge and buy a Garmin. After thinking about the amount I wanted to spend and the features included in the models I was considering, I decided to buy the Forerunner 305. I was still nervous about the size of the watch–I have extremely small wrists (even for a girl) and I didn’t want to feel like I was carrying unnecessary weight on my runs. The price was right–only $125 on Amazon including the heart rate monitor. I figured it was a steal and decided to buy it last week. Needless to say, I was psyched to start using it yesterday. On the nice days this past spring, I (more often than not) decided to use the treadmill at the gym for my speed workouts instead of running outside because I wanted to make sure that I was running my intervals at the correct pace. Even when using Runkeeper, it was hard to determine my splits. Now, all I have to do is program the workout accordingly, press Start, and occasionally monitor my speed throughout my run. I took the FR 305 for its second “test drive” tonight and I’m really pleased. The only issue left to settle is the heart rate monitor strap. The standard size isn’t small enough to fit my ribcage and stay put throughout the run. Turns out the Garmin store on Michigan has an x-small option for 8 bucks. I’m sold. What do you use to track your workouts? 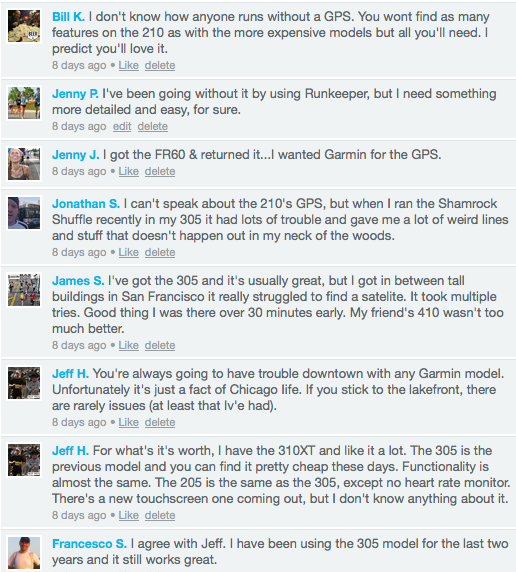 If you don’t have a Garmin, have you ever considered getting one? I LOVE Gary, my Garmin. We’ve been together almost a year now, and although we’ve had a few rough spots (batteries dying, him forgetting the data…) I can’t imagine my life as a runner without him. Especially as you start to be more driven by the dreaded clock…..hope you love yours too! I need to find a name for my Garmin. Hmmm…Jack? I like it. I honestly can’t believe it’s taken me this long to buy one. It’s been nice to just strap it on and go, as opposed to dealing with buttons and stuff on my phone. I’ll keep you posted! Hey Jenny – I like your post. I have a polar watch w/the HRM and band and decided to upgrade to the Garmin 305 when I started running halfs. It takes some getting used to especially for it’s size. I’ve been using it for years and now I don’t even think about it. Must definitely read the instructions… at least I had to. Here is a link to the data of my run at this year’s shuffle. As you can see it’s not perfect but for the most part accurate. Hi Carlos– Thanks for the feedback. I’m really happy with the 305 so far. Happy to have something convenient and easy.